Selling exclusively over the web through cornerstone.co.uk, Cornerstone offers a regular, flexible delivery of razors and men’s shaving products meaning that men always have everything they need for a great shave. Oliver Bridge, a graduate of Oxford University, worked in marketing and then venture capital before embarking on his entrepreneurial journey. The team secured £898,000 investment with a crowdfunding campaign to help grow their business. With a strong vision for the business, Oliver went on to secure backing from a group of angel investors – raising a further £160,000. We spoke to Oliver about the development of his idea and the support that helped implement it. How have the London Small Business Centre supported you? When I started Cornerstone I was living in Shoreditch at the time and had heard good things about some of the work that the London Small Business Centre had been doing. When I decided to apply for a £5,000 Start Up Loan to raise some seed finance, it was a natural choice to go and speak to them. When I applied for the Start Up Loan, my advisor Jim was very challenging (in a good way) and got me to think through my business plan in thorough detail – this ultimately helped when I went on to the angel investors later that year. Tell us more about the idea and motivation behind Cornerstone? As a consumer, I had never enjoyed shaving – it was uncomfortable, the products were too expensive, and when I finally got round to replacing my blunt razors, I had to spend my lunchtime queuing in Boots. I thought there had to be a better way. So, I created Cornerstone. How did you secure investors? In 2015, I had an initial target to raise £500,000 by crowdfunding. That target was surpassed and we secured a staggering £900,000. We basically want to grow as fast as we can – that means hiring more staff, investing more in marketing, building up our stock – all things that require lots of cash! I wanted to work with the best people in their field rather than trying to do everything myself. More broadly, I have built Cornerstone to be scalable so that we could handle a surge of orders if we had to without serious disruption – we have an outsourced logistics function and the website talks seamlessly to the team there – in theory, I could run the business from Starbucks on a laptop whilst we send out hundreds of parcels a day. Having been trading for a couple of years now, the market hasn’t changed a great deal, but what we’ve done is prove to ourselves and our investors that we know how to tackle this market and give customers what they want – that’s made us investment-ready. 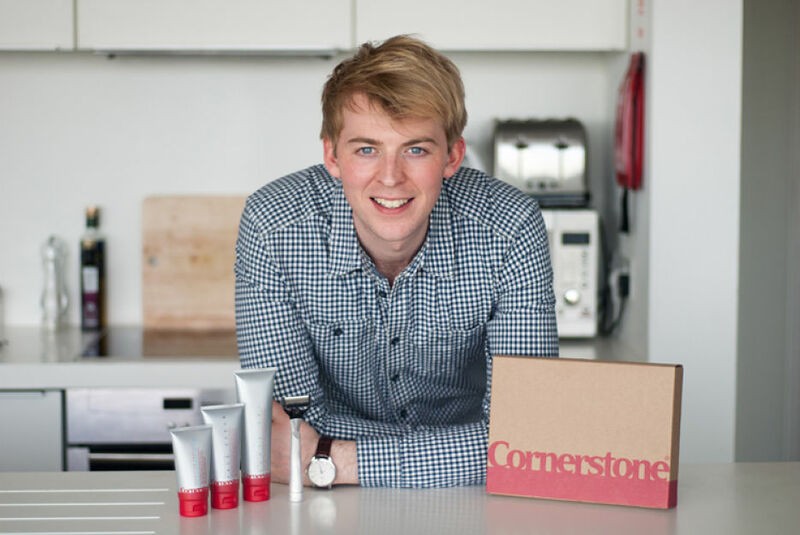 We are now working on convincing UK men that Cornerstone is a better way of shaving. In five years, I hope to be leading Cornerstone into Europe and the US and in ten years, hopefully I’ll be relaxing on a beach somewhere.